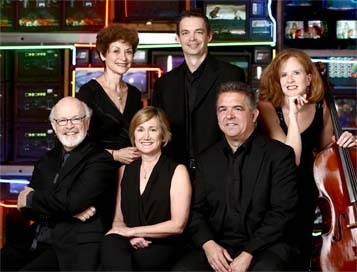 Founded in 1975 as the 20th Century Consort, the group became the resident ensemble for contemporary music at the Smithsonian Institution in 1978. In its annual series at the Smithsonian American Art Museum, the Consort presents finely balanced concerts frequently related to the museum’s exhibitions, featuring music by living composers - often world premieres - along with 20th century classics. In 1990, the Consort was awarded the Smithsonian Institution’s Smithson Medal in honor of their long, successful association. Under the direction of its founder and conductor, Christopher Kendall, the Consort’s artists include principal players from the National Symphony Orchestra, along with other prominent chamber musicians from Washington, D.C. and elsewhere. For over forty years live concerts by the 20th/21st Century Consort have been professionally recorded. In 1995 the Consort initiated a project to create a permanent archive of these recordings. As of this year 40 seasons, 170 concerts, 570 compositions by 232 composers, in 706 performances were presented for permanent preservation to the Michelle Smith Performing Arts Library of the University of Maryland. The physical media include over 900 DVDs and CDs. Thanks to a grant from the National Endowment for the Arts you can listen to any of these recordings, today, here, free. You can read the printed programs for each concert and experience what happened on that day and in that place. Visit our archive page to search the entire archive and listen to any concert, composition, or composer. We end our season in a state of war: the Smithsonian American Art Museum’s "Artists Respond: American Art and the Vietnam War, 1965-1975,” that is. This ambitious exhibition has elicited an equivalently ambitious program for the occasion. At least, a week before the concert, as rehearsals intensify, it FEELS ambitious! These are marvelous, challenging works, including two virtuoso pieces for pairs of instruments by Jim Primosch (In Times like These, for clarinet and piano) and Christopher Theofanidis (The World is Aflame, for violin and cello). Both works comment, by way of their titles and otherwise obliquely, on the circumstance of war, then and now.